Donté Wilder, 25, walked into the Double Connections grocery store on 19th Street and Girard Avenue on March 11, 2007, just as he always did in his North Philadelphia neighborhood. The seventh-annual Walk for Life offers support and unity for families affected by violence in Philadelphia. 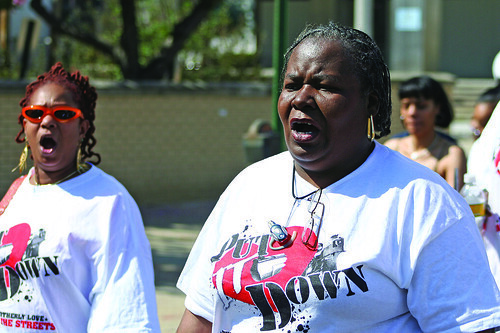 Mothers United Through Tragedy sponsors the yearly event (Nic Lukehart/TTN). Moments later, he was shot execution-style by a masked gunman and died three days afterward. Two years later, the case has yet to be solved. He was known to those who loved him most as a devoted father, a protective son and brother and a caring soul. His mother, Beulah Wilder, said her son was no stranger to the Philadelphia Police Department. Her son was “no angel,” she said, but the incident shouldn’t have happened. As she prepared to bury her son, Wilder met Shirley Boggs of Mothers United Through Tragedy. Wilder said Boggs comforted her family and called every day to check on her. Unfortunately, stories like Wilder’s are all too familiar to Boggs, CEO and founder of MUTT. She formed the organization in 2003 to provide assistance, support and help for the loved ones and victims of violence. She traveled to crime scenes and held hands of mothers as they took their first trips to the morgue. She also makes herself available to the public 24 hours a day through the company hotline. Due to a lack of government funding and lack of donations, Boggs runs the organization from home. But through her faith in God, she said she has found the strength to move on and fight for those without a voice. A victim of violence herself, Boggs’ son Quentell, 20, was shot on the streets of Philadelphia on Aug. 13, 1997. After winning a sum of money gambling on the streets, word traveled through the neighborhood. A 20-year-old North Philadelphia man sought to rob Quentell but ran into his identical twin brother, Quentin, first. Unable to tell the difference between the two men, the gunman shot Quentin once in the leg, but he survived. Quentell wasn’t so lucky. He was shot four times – once in the back, and then the gunman stood over him and pumped three more bullets into his helpless, lifeless body. Quentell made it to the hospital that night but never made it out. Twelve years later, Boggs still feels the pain from the loss of her firstborn son, but she stays strong for the people she needs to help every day. In the time following her son’s death, she battled feelings of depression and thoughts of suicide. But instead of taking her own life, she put her grief to work and formed MUTT. The organization’s mission is to bring social change and awareness regarding the misuse of firearms through education and to remember loved ones – “stolen dreams”– who tragically lost their lives on the streets. In the intimate gathering, family members shared bittersweet memories of their loved ones and gave words of encouragement. One by one, people thanked Boggs for her dedication and support in their times of need, including Mohamad Amer. Two years ago, the 22-year-old killed a 19-year-old while drinking and driving. Loved ones of homicide victims and MUTT volunteers also spoke, but there was an eerie trend among the mothers – many of them knew each other prior to their sons’ deaths. “Her son was my son, and my son was her son,” one parent said. “It says something about the neighborhood that all these women knew each other,” said Aziza Kinteh, who was asked to speak at the event. She is a poet, author and Temple alumna. Police Commissioner Charles Ramsey, who made a brief appearance at the event, said there have been 84 murders in Philadelphia so far this year. He said the good news is 75 percent of last year’s cases were solved, but the bad news is the families of victims who make up the remaining 25 percent still live in anger, sadness and fear. Wilder remains among the mothers without answers for the deaths of their sons. She knows little information about what happened that day and is still unsure of what made her son a target. Since Donté’s death, she tries to remain strong for her other three children and her grandchildren – Amani, 8, Amil, 6, and 1-year-old Dante, whom he fathered shortly before his death. But there’s only so much she can bear. Wilder refuses to forgive the gunman. Boggs went through a period of anger toward the gunman, who was eventually brought to justice and sentenced to jail time. Faced with the responsibility to provide “hope for the hopeless,” Boggs turned her anger into a passion for her cause. Despite what she has done with the community and her organization, she humbly refuses the credit for doing so. The 48th-annual Philadelphia Antiques Show attracted exhibitors across the East Coast for three days to display and view rare artifacts and collections. Well written. It was an event that needed to be written about and you did a great job! I was there yesterday… My mother said that she wanted to go even though her hip is fractured.